The Southend Art Club, of which I am a member is having its annual Spring Exhibition for 2014 at the Cliffs Pavilion, Southend on Sea in March and will have over 300 painting on show and for sale. 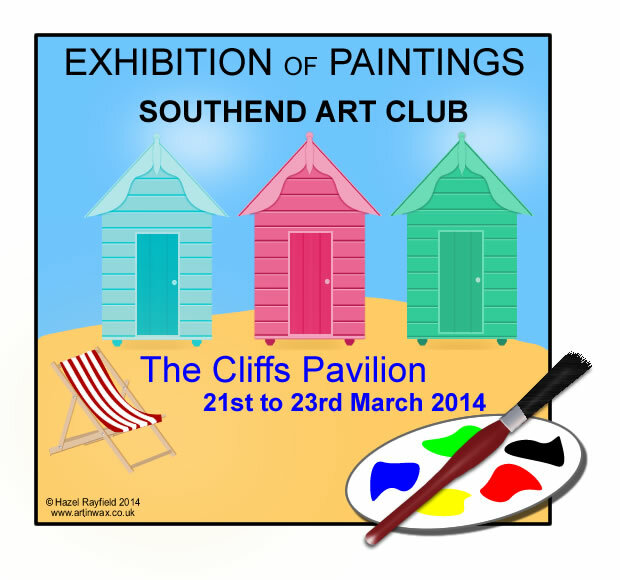 The Southend Art Club Spring “Exhibition of Paintings” opens at 10am on Friday the 21st March 2014 to 4.45pm on Sunday 23rd March 2014. Admission is Free and there will be a wide and varied selection of Art on show and for sale including some pieces of Art In Wax. Closes 4.45pm on Sunday 23rd March 2014. I have three framed pieces in the exhibition and there will also be a selection of non framed Art In Wax for sale. The Cliffs Pavilion is a local theatre in Westcliff on sea, and is the venue for the Southend Art Club Spring Exhibition, the Cliff Pavilion address is Station Road Southend-on-Sea, Essex SS0 7RA. Look Forward to seeing you there …….